© Super Empty illustration. With the right combination of precise planning, spontaneity, and controlled chaos, a small crew was able to create a new anthem for the Tar Heel State. North Carolina has an interesting history with hip-hop. Recognized nationally as early as 1991, when A Tribe Called Quest dropped a reference to “North Cak-a-laka” on the song “Scenario,” North Carolina has put unmistakable stamps on hip-hop culture in the years since. You’re probably familiar with some of the names: 9th Wonder, J. Cole, Rapsody, and yes, even Fred Durst. But oddly, there hasn’t been a proper North Carolina anthem since Petey Pablo’s 2001 smash hit, “Raise Up.” At least, not until last year. 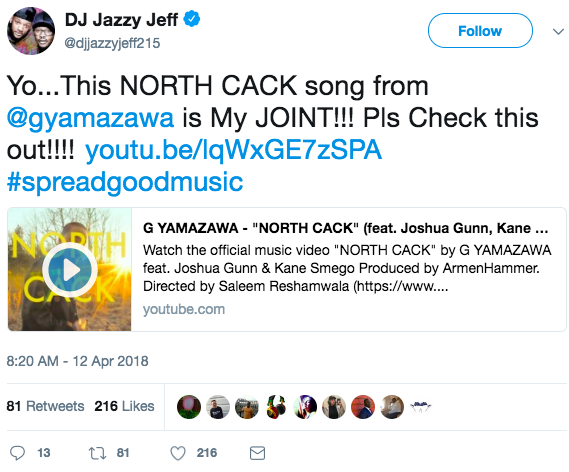 If you lived in North Carolina during the summer of 2017, along with the fierce debates about politics and barbecue, your Facebook timeline blew up with “NORTH CACK,” a song and video by G Yamazawa. Thanks to the song’s trunk-rattling instrumental and a raw “one-take” video, “NORTH CACK” inspired the highest use of fire emojis per capita in the country (data not available), and helped it win Best Music Video at the 2017 Hip Hop Film Festival. With the right combination of precise planning, spontaneity, and controlled chaos, a small crew was able to create a new anthem for the Tar Heel State. Recently, I spoke with director Saleem Reshamwala (aka KidEthnic) and Yamazawa himself to learn how the video was made, how almost everyone involved in its creation has at least two names, and how the insanity of 2017 helped this video blow up. Ned Phillips, the director of photography, didn’t even use a dolly or a wheelchair. That means Ned carried the 20 pound Ronin camera rig around the entire time. So just how did they do it? Here’s the short version: every time you see someone disappear out of left frame, they sprint behind the camera to their new mark and immediately must A) look cool in the background, B) dance, C) rap on cue, or, D) all of the above. But the long version is so much more fun. To give you an example of the controlled chaos that helped make this video possible, I’ll walk you through the blocking. The video opens on a grassy field in rural Durham County. The plan was to shoot in Reshamwala’s neighborhood, where they had originally tested the concept with his iPhone. But with the frequency of cars driving by, that soon became problematic. Being a born-and-raised Durhamite, G Yamazawa had an epiphany. G remembered a friend’s house near where he grew up, called him while they were testing, and within a few minutes, there was a new shooting location. During shooting, Ned is holding the camera. Saleem is behind Ned, shouting commands. Production assistant Dionne Liles is behind Saleem, holding an ice light to counteract the setting sun. And assistant director Mandy Padgett is behind Dionne, holding a speaker to help the performers sync up with the music. Like a flock of birds, they remain in this formation for the entire video. As the frame pushes forward, a dirt bike races past (with a broken transmission, by the way—more on that later) and we come upon G walking through the frame, with the production crew staying stride for stride. As Yamazawa begins to repeat the opening chorus, the amazing krump dancer Ryan Taylor (aka Native) first appears, along with rapper Kane Smego (aka… actually it’s just Kane Smego). As soon as Native and Kane disappear out of the left frame, Saleem yells at directs them to run behind the production crew. Soon, Native is ready to pop back into frame right while Kane waits further down the road. Yamazawa continues for a few more bars before getting pushed out of frame by Native, while we see the track’s third emcee, Joshua Gunn (aka J. Gunn), looking super cool in the distance. As soon as J.Gunn passes out of frame, he books it to meet Kane for their conversation, which will take place behind G as he finishes his verse and restarts the chorus. Once they’re out of frame, Smego trails the production crew, while J. Gunn runs to his mark for the second verse. As the camera pans past a pickup truck (with a man with a broken leg, known simply as W.F., in the bed), Kane sneaks into the passenger seat, Yamazawa hops on the hood, and Native starts krumping. This is the moment where the camera crew gets a hard lesson in Kepler’s Laws of Orbital Motion. While Ned, the DP, has to move at a slightly brisk pace around the rapping J.Gunn, the rest of the crew have a much more difficult task. Saleem, Dionne, and Mandy all have to move progressively faster to avoid ending up in the shot. After the spin cycle, we go back to the truck. W.F. has donned a wool cap, we have a father and son in the bed (they live nearby), Yamazawa is on the hood, and Smego comes out for the third and final verse of the song. Perhaps the most amazing fact about this video is that they executed all of the above in one take, on the first attempt. And perhaps the most heartbreaking fact about this video is that half of that take was unusable. “We thought we nailed it (on the first try),” says Reshamwala. The stars had aligned… literally. The golden hour was happening right as the crew was ready to do a practice take and it created a beautiful lighting effect piercing the forest in the background. And they ran a flawless shot. Not a single flubbed line. Not a single miscue. Except for one problem. You may have noticed that I used the phrase “one-take” in quotes earlier. Although they did indeed film the entire sequence without interruption, the shadows cast some darkness on an otherwise perfect take. So they took the two different takes and artfully stitched them together at the 1:39 mark. Saleem was worried the edit was a blemish on an otherwise remarkable smooth shoot. Serendipity was a recurring theme with this music video. Many of the people involved with the shoot had not met prior to that day. The aforementioned dirt bike’s transmission was broken so the rider was only able to start it, run it, and stop—hence why you see it parked in the distance later in the video. The guy in the pickup, W.F., broke his leg, leaving the crew scrambling to find someone else to drive his pickup with the skeleton arm to the location. Although it wasn’t planned, it ends up being one of the more entertaining details of the video. “It’s actually kind of my favorite part,” says Reshamwala. Originally there was no plan to have a dancer in the video. But as they were planning the shoot, watching performers go in out of frame, they noticed there were these long moments with nothing interesting happening. “Then G said, ‘Yo, I know this crazy krump dancer.’ And that’s Native,” says Reshamwala. The concept was tested on Saleem’s iPhone in his neighborhood streets with Ned sitting in a wheelchair. “That day when we got there, a lot depended on everyone being up for me yelling at them to sprint in circles around me,” says Reshamwala. “I knew this was a concept that could be really cool, but a lot depends on the performances. And whether everyone is really down for taking weird commands,” says Reshamwala. And because everyone was up for it, it all came together. Listen to our interview with G Yamazawa on Episode 14 of the Super Empty Show. So that’s how the “NORTH CACK” video was made, but how did it become a song that’s heard in clubs, sports arenas, and blasting out of cars with the windows rolled down, a year later? The next morning, TeamBackPack, a major hip-hop media platform, shared it on their Facebook Page. The song has since become a hit with choreographers around the world. “People in Portland, Indonesia, Guam, people all over the world listening to this record and dancing to it has been dope,” says Yamazawa. Even Duke, for years known as the Gothic Disneyland walled off from the rest of Durham, has embraced the song and the hometown anthem. Now you routinely see students, alumni, and even the new university president alike throw up the horns with pride. You’ll find Yamazawa’s song in Blue Devil hype videos and hear it in Wallace Wade Stadium during games. Even certain Tar Heel fans can appreciate the love. And most recently, the video gained attention from one of the most famous DJs of all time. However, things aren’t exactly all hip-hop and rainbows in the Tar Heel state. North Carolina is experiencing just as much turmoil, if not more, as the rest of the country. And that turmoil may have had a hand in the video’s popularity. A state that is known just as much for its “bathroom bill” as it is for basketball. A state that voted for Clinton, Bush, Obama, and Trump. A state receiving national attention for racially motivated gerrymandering that also has, for the first time in its history, six female African American police chiefs. And yet in the summer of 2017, this video might not have been released at a better time. Right in the middle of a year regarded as one of the most chaotic and stressful in recent memory, a melting pot of cast, crew, and extras came together to create an incredible piece of art. The video is a dichotomy of polished and raw, of planning and spontaneity. In front of the camera, the video appears meticulously timed to the second. Behind the scenes everyone is scrambling around a nondescript dirt road in the North Carolina country. At times the camera seems to be on a rail, incapable of breaking focus. At others it appears to have an Alfonso Cuarón-esque character to it, getting distracted by something out of frame. North Carolina wasn’t asking for a new hip-hop anthem, but it couldn’t have asked for a better one at a better time. Craig Carter is a local writer, improviser, and proud Durham resident. For more on G, check out our most recent episode of our podcast, The Super Empty Show, where we talked about the differences in performing poetry and rap, what he loves about coming home, getting recognized by heroes, and more. SUBSCRIBE on iTunes or listen on SoundCloud.